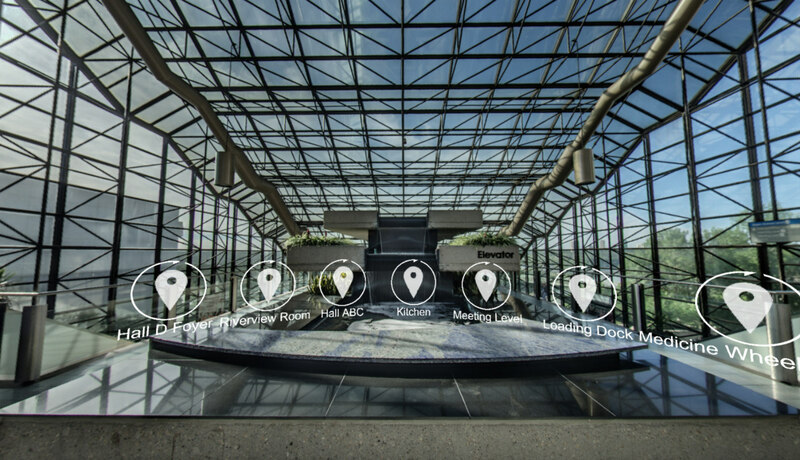 The Edmonton Convention Centre (SCC) and Full Circle Visuals are pleased to unveil a fully immersive 360 tour of Edmonton’s premier convention centre utilizing virtual reality technology. Event planners and guests can now experience the beautiful spaces within the Edmonton Convention Centre and awe-inspiring views of Edmonton’s River Valley before stepping foot in the venue. Created by Full-Circle Visuals, a Startup Edmonton launch party featured company, the tour allows planners from anywhere in the world to see what the venue’s event spaces look like from a variety of vantage points and setups, including banquets, meetings and weddings. Additionally, planners who are visiting the convention centre will be able stand in an empty hall and experience the space as if an event were occurring. 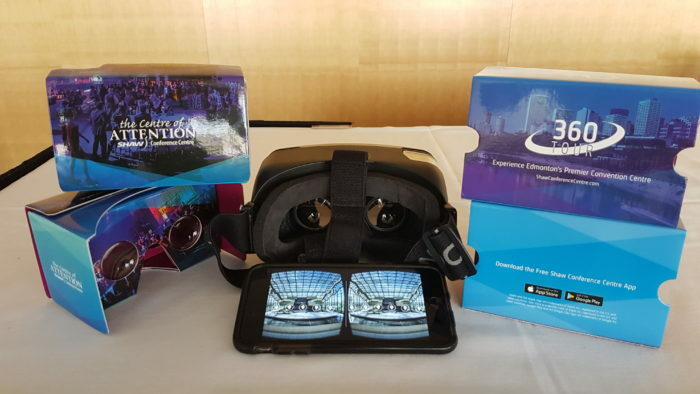 The Edmonton Convention Centre and Edmonton Tourism will provide custom branded Google Cardboard glasses to regional, national and international meeting and event planners. The 360, immersive tour is accessible via the Edmonton Convention Centre App in the Apple and Google Play store, with a web tour available here. As divisions of Edmonton Economic Development Corporation (EEDC), the Edmonton Convention Centre, Urban Economy (Startup Edmonton) and Edmonton Tourism work in unison on initiatives that generate economic impact and build the brand and reputation of our city. For more information, visit EEDC.ca. The Edmonton Convention Centre, which is owned by the City of Edmonton and managed by Edmonton Economic Development, is a top contributor to the meetings, conventions and special event business in Greater Edmonton, hosting more than 650 events and half million guests each year, who in turn generate $45 million in spending across the province annually. Full Circle Visuals is a creative visuals company rooted in photojournalism and engineering. They produce high-end 360-degree video and virtual reality experiences for businesses and media organizations.